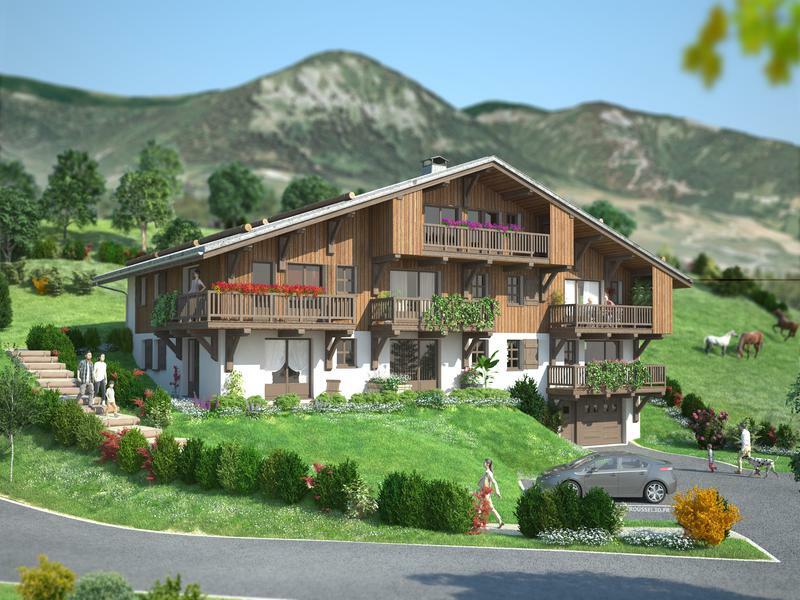 Quality new 2 bedroom first floor apartment for sale in Praz sur Arly within easy reach of Geneva, neighbouring Megeve and part of the Espace Diamant ski area. 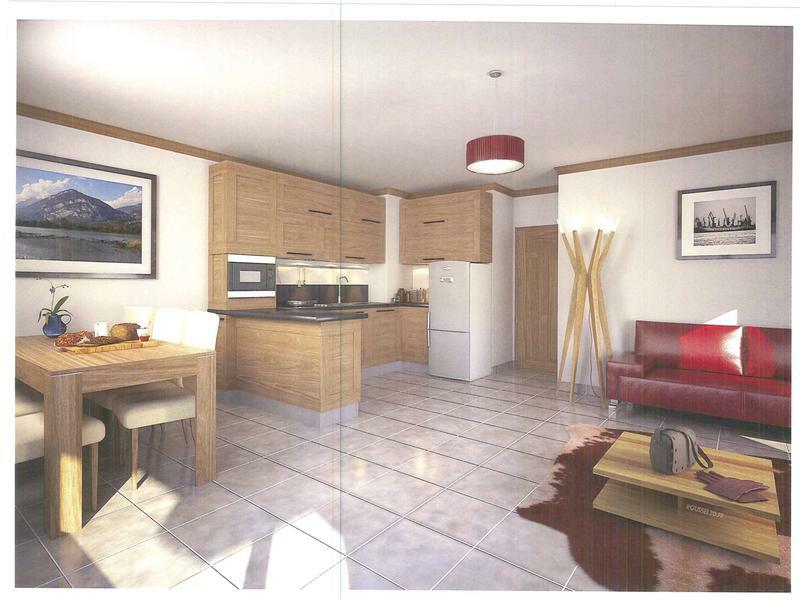 Fantastic opportunity to purchase in this lovely new chalet style development. Located close to bars and restaurants while enjoying a quiet location with breathtaking views and great access to the Espace Diamant ski area with nearly 200 km of pistes to enjoy. As well as winter sports,Praz sur Arly has plenty to offer in summer - famed for hot air ballooning, there are many other activities; mountain biking, local lakes, golf and renowned hiking in the area. Apt Lot 5 Entrance hall with plenty of built in storage for coats and shoes. Separate WC. Equipped shower room with double sink unit Double bedroom enjoying south facing views Small single bedroom (cabine) - window to the south Open plan fully equipped kitchen and living area with south facing balcony. Private parking and cave/ski locker. Praz sur Arly is a pretty little village on the border of Haute Savoie and the Savoie departments and has a choice of bars and restaurants as well as local shops and is just 10 mins drive (4.9km) from Megeve. The Espace Diamant area ski area is one of the most undiscovered areas in the Alps, spanning the Savoie and Haute Savoie departments with nearly 200 km of uncrowded slopes for all levels and includes the resorts of Praz, Flumet, Notre Dame de Bellecombe , Crest Voland, Les Saisies and Hauteluce which links to Les Contamines, part of domaine Evasion area, the 3rd largest in France with 445 km of piste coming all the way round to Megeve via St Gervais and Combloux. The proximity to Megeve gives great access to shops bars and restaurants in one of the most renowned resorts in the Alps not forgetting the Palais des Sports the largest sporting complex in the Alps with indoor and outdoor pools, spa facilities, a great gym, climbing, tennis both indoors and out , ice rink for ice hockey and skating and a host of other sports and activities besides. Geneva airport 75 km - approx 1 hour Regular bus services to Geneva Easy motorway drive from Calais. Development An exclusive new development of 7 apartments all designed with traditional style and modern convenience in mind. 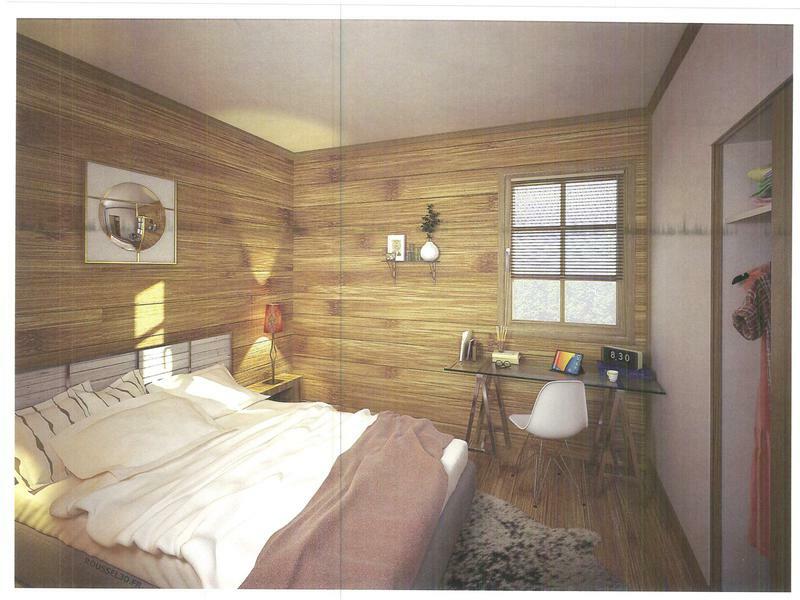 Each apartment comes with cave and exterior parking place as well as the option to purchase garage parking (16,000€). This newly completed ski area is a hit. It brings together some of the prettiest ski resorts in the Alps, and when you’re floating around on the super light snow found in the area there is one word that sums up the experience of skiing this domain – scenery – it’s really pretty, it’s really stunning. 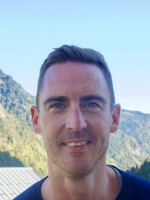 For much of the skiing you are under the watchful eye of Mont Blanc the highest peak in Western Europe, which provides a sensational backdrop to any activity. The snow record for this area is exemplary and opens from mid Dec to late April in spite of being a relatively low area; they call it the Mont Blanc effect. Snow seems to fall here when surrounding resorts are not being so lucky and many a time I’ve been over to find fresh thigh deep powder when all around are praying for snow. It is made up of five resorts; Crest Voland Cohennoz, Flumet, Hautluce, Notre-dame de Bellecombe, Praz sur Arly and Les Saisies and most of these resorts have their own satellite villages and resorts such as Bisanne 1500 which, whilst it has its own lifts, is classified as part of Les Saisies. 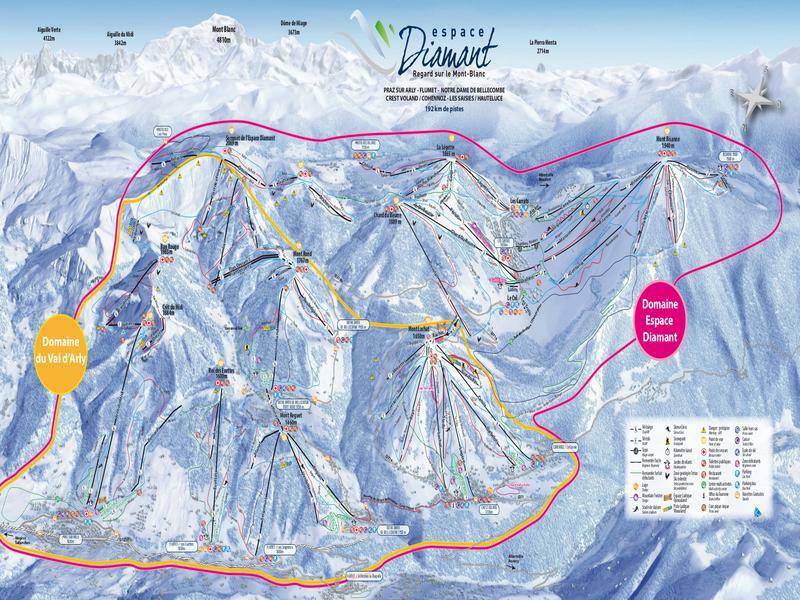 The Espace Diamant has 185kms of marked piste; 31 green runs, 59 blues, 47 red and 11 black, so something for everyone and in addition 4 bordercross trails and 3 snowparks add to the ensemble. Because of the newness of the area the lift system is good and efficient. This whole area is extremely good for families; it is not for the full on party animals but there is a pleasant vibe in these resorts. In the summer the place is absolutely stunning; incredible vistas and flower meadows take the breath away and it is a great place for all types of mountain adventures whether of the gourmet, relaxing kind or full on adrenalin kind!